Built as a proprietary chapel in 1821, it was typical of its date, resembling a nonconformist chapel with a stuccoed exterior with a main façade consisting of two tiers of large round headed windows beneath a large pediment. The overall effect was thus classical, though the glazing bars of the windows display a primitive form of gothic. 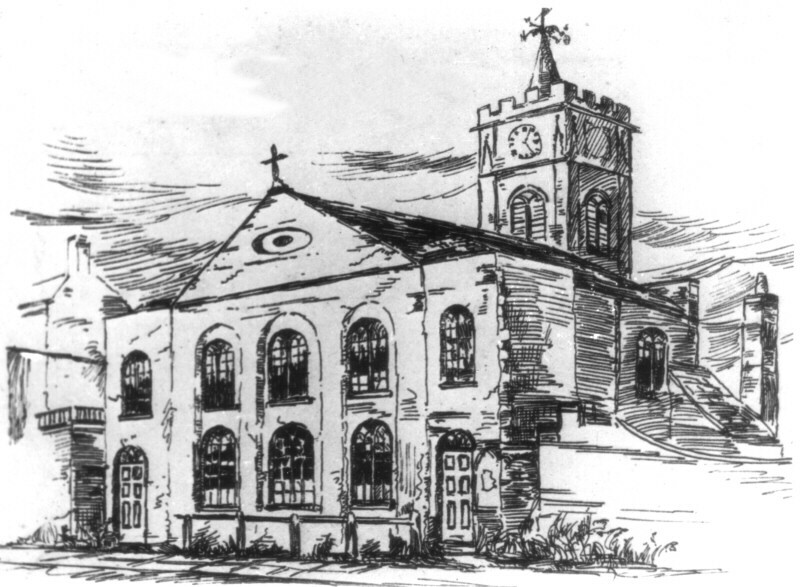 A tower with battlements and a low spire and perhaps more assured in style was added behind the main body of the church around 1834, the date of an application to the ICBS. The architect named was W Wonham, who may also have had a financial interest in the original chapel. The plan accompanying this application shows the interior of 1821 had galleries on four sides, as is also apparent from the two tiers of windows. The body of the church was pulled down in 1891 after the new church of St John the Baptist, London Road was built, but the tower only gave way to a car park in 1961 (Elleray p46).